What are detections for leukemia? Most people are inclined to know the detections of leukemia, for that can help to find out related symptoms and perform treatments in time. 1. Blood routine examination. It is to take a little blood from finger or ear lobe to check the quantity of red blood cells, white blood cells and platelet, meanwhile to classify the white blood cells. Normally, juvenile blood cells (for short is juvenile cells) should not appear in peripheral blood. But when someone is suffering from leukemia, juvenile cells can be seen in blood routine test for they are released to peripheral blood while they are not differentiated and mature enough in bone marrow. 2. 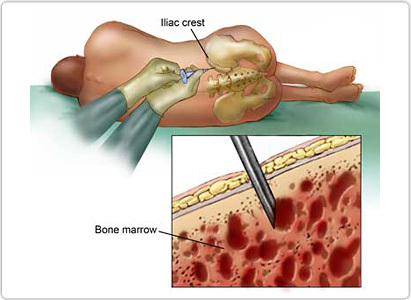 Routine examination for bone marrow. If it is suspected to have leukemia, bone marrow puncture test is necessary to count and classify all kinds of cells from bone marrow. Normally juvenile cells take not over 5% in bone marrow. But when one develops leukemia, his juvenile cells can increase at most 30% more, especially for acute leukemia of children, that can reach 80-100% more in bone marrow. 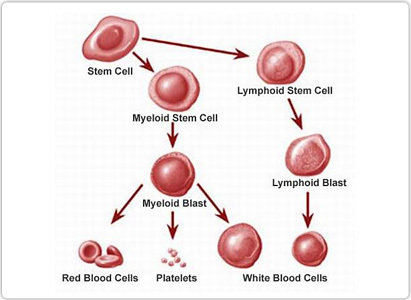 Bone marrow examination is a most weightily proof to diagnose leukemia. It is not difficult to detect leukemia by combing with clinical signs and physical examinations when this bone marrow examination indicating an obvious increase of juvenile cells in bone marrow. However, treatments would be different as the types of leukemia vary. Then further examinations should be taken to confirm the type of leukemia. 1. Immune typing examination. It generally has to take around 2 ml bone marrow to identify and classify the leukemia cells with a reagent named clonal antibody. 2. Cytogenetic examination. This examination also has to take about 2 ml bone marrow to know if any abnormality of leukemia essence and chromosomes. The prognosis usually would be poorer to the leukemia patients with chromosome disorder than those without chromosome abnormality. 3. Examination of cerebrospinal fluid is to confirm if leukemia cells encroach on brain and spinal system by drawing out a little cerebrospinal fluid from lumbar spinal canal of patient for chemical examination. If being encroached, that is what medically called leukemia of central nervous system. Specialist from Modern Cancer Hospital Guangzhou figured out that, except what mentioned above, there are X-ray examination (including chest X-ray, skull X-ray and bone X-rays of limbs and so on) examination of ocular fundus, ECG(electrocardiogram), ultrasonic examination of liver and spleen, blood biochemistry, immune functions, related virus examination and so on. All those examinations can indicate that whether the main organs of patient are working normally and if any encroachment of leukemia cells occurs, which at the same time are the preparation and direction for further treatments. Research on biotherapy has gained great progress in recent years. 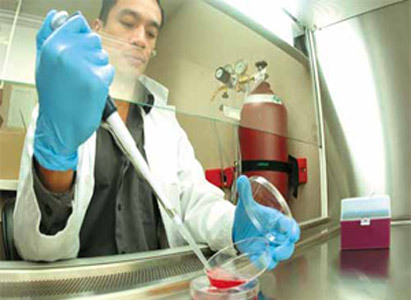 DC-CIK biotherapy techniques aim to activate the immune mechanism to improve the immunity of the patient and eliminate the cancer cells as well as inhibit their reproducing, thus to prevent recurrence and metastasis.